Holy house-made hot dogs, Sydney love's an American-themed bar. I wonder if there's a bar in Manhattan doing its best impression of a regional Aussie pub? Not one of those backpacker-bait joints with novelty road signs and a 2003 Swans game on repeat, but somewhere with Tooheys New posters Blu-Tacked to peeling yellow paint, Keno on the telly and schnitzel cooked to a level known as "shiv possible". Surry Hills is home to the latest joint to nail vintage beer paraphernalia to a wall and serve slow-cooked brisket. Where the nearby Forresters has dive-bar kitsch in the bag, and Shady Pines nails honky-tonk, Surly's is closer to a US college sports tavern. On a Thursday night the place is packed and three out of four flatscreens are showing The Cardinals demolish The Phillies in baseball. The other TV is screening Ultimate Fighting Championship – a "sport" for which you cannot overestimate the hoot I do not give. There's big cushy stools at the bar spaced just the right distance apart so you don't knock knees with other barflies, an odd mix of blokes wearing Ralph Lauren jumpers or beanies from Lowes or both. They're an ideal perch to fasten your trucker cap and get acquainted with Colorado's favourite adjunct lager, Coors. It's on tap here and every bit as watery, crisp and slammable as it is in a can. There's a few craft beers too (Mountain Goat, Modus, The Grifter), but c'mon – when there's Coors and baseball ... hey, batter, batter swing! Surly's cocktails have about as much subtlety as Uncle Buck's "Buck Mobile", but like Buck, they know how to have a good time and treat you right. Highlights include an Old Pal ($14.50), a bare-knuckle-boxing negroni containing Jim Beam rye instead of gin, and the John Daly ($14.50). Named after golf's patron saint of boozing, this vodka-spiked twist on the dignified Arnold Palmer (that's a tall glass of ice tea and lemonade) is a refreshing sipper perfect for smoked meats. 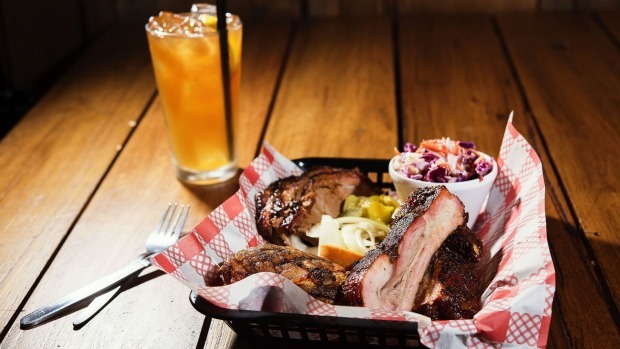 Each barbecue plate comes with your choice of two sides and homemade cornbread, which is really more of a corn fairy cake. I order beef brisket ($18) and chicken thigh ($11) and choose pub-standard fries, forgettable coleslaw, watery green beans and mac'n'cheese that tastes like a childhood afternoon in front of cartoons on the ABC. The chicken dinner is a winner, with fatty skin and juicy white flesh that tastes like a campfire. The brisket, not so much. Its salty, smoky flavour is tops but the meat just isn't as submissive as American barbecue should be. The highly smashable Surly Burger ($13) is a much better time and three cheers for the use of iceberg lettuce. 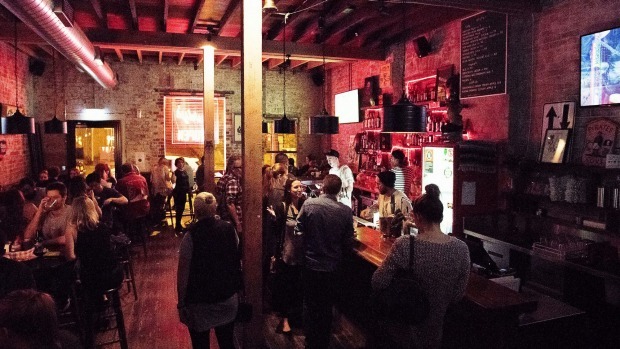 Surly's doesn't offer anything tremendously new to Sydney's bar scene, and I doubt it aims to. The staff just want you to have a good time, and if you manage to grab a seat, there's a very good chance that's exactly what will happen. And baseball fans rejoice: you don't have to watch every Major League game at Cheers anymore. Go for… Coors and a Cubs' game. Stay for… the cheese-dripping menu. And… expect to share a table with strangers at peak times.